Studio type, Good for 1-3 persons, FREE WIFI, with 24/7 CCTV, air-conditioning, own toilet & bath, standby generator, wall fan, Hot & Cold shower, 1 single bed, hanging cabinet, telephone/Cable ready & Sprinkler & Fire Alarm System. You searched for 432 bs aquinod drive brgy. villamonte bacolod city negros occidental and this page shows the full details of this accommodation to let. 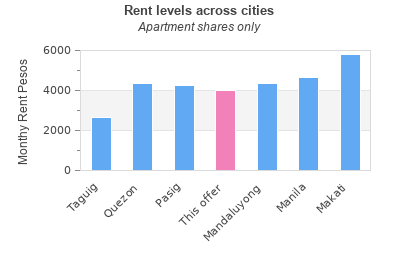 This Apartment is located in Almanza in Las Pinas. This property has bedrooms, bathrooms and the rent is PHP 4000 monthly. This accommodation for rent was last updated on 2017-03-30 09:28:55. The classified has been displayed 317 only today. 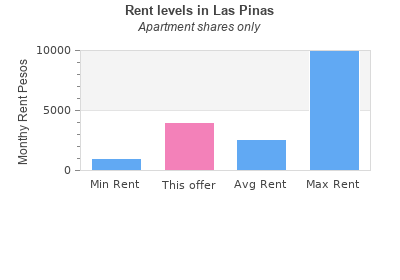 You can see other lettings in Las Pinas.